An image of stellar-mass black holes surrounding Sagittarius A*, the supermassive black hole at the center of the Milky Way | Nature and Hailey, et. al. 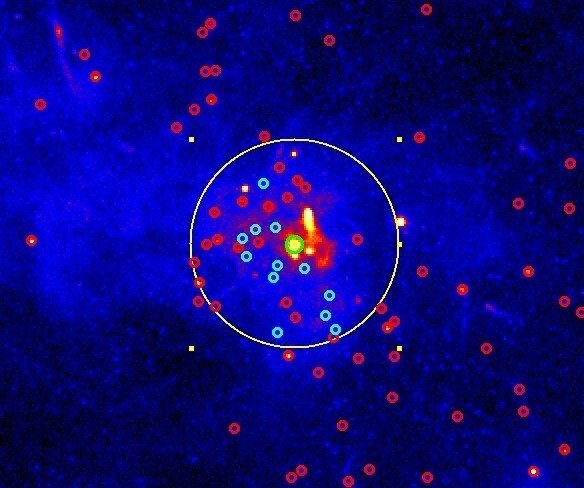 Data from the Chandra X-ray Observatory suggests clusters of stellar-mass black holes surround Sagittarius A*, the supermassive black hole at the center of our galaxy. A	A	stronomers have long predicted that thousands of smaller stellar-mass black holes should exist in the area surrounding the big supermassive black holes at the center of large galaxies. However, searches of our own galactic center in the past couple of decades had not found any evidence of these black holes, ones that are just a few times heavier than our sun. But now, a new search of archival data from the Chandra X-ray Observatory has finally yielded the discovery of a dozen such black holes grouped around Sagittarius A*, the supermassive black hole at the center of the Milky Way. The researchers say that the properties and distribution of these black holes suggest there should be hundreds — and perhaps thousands — of them within a parsec (approximately 3.3 light-years) of Sagittarius A*. Additionally, our galaxy should be representative of other similar galaxies, so they, too, likely have a comparable constituency of stellar-mass black holes. The black holes Hailey and his colleagues discovered come in the form of inactive or “quiescent” low-mass X-ray binary systems. These are binary star systems in which one of the components is a black hole and the other is usually a normal star. The gravity of the black hole pulls matter from the star, which releases gravitational energy as X-rays. A typical low-mass binary emits almost all of its radiation in X-rays and usually less than one percent in visible light. But these X-ray objects are extremely hard to find. Hailey added that finding black hole binaries specifically in a relatively small area six light-years across is very difficult. The central region of our galaxy is a crowded place, filled with lots of other X-ray sources that aren’t black holes. Plus, there is also a lot of hot gas and dust crowding the field, so it’s a confusing mess. Hailey said Chandra's capabilities were key to finding the black holes. Hailey and his team searched through 12 years of Chandra data for X-ray signatures of black hole, low-mass binaries in their inactive state and were able to find 12 within three light years, of Sagittarius A*. But where there are low-mass binaries, there are also isolated black holes, too, and likely many more solitary black holes than binary systems. Hailey explained that every now and then, an isolated black hole catches a passing star by gravitational attraction and makes a black hole binary that will emit X-rays. The researchers say there must be anywhere from 300 to 500 black hole, low-mass binaries and about 10,000 isolated black holes in the area surrounding Sagittarius A*. “The Milky Way is really the only galaxy we have where we can study how supermassive black holes interact with little ones because we simply can't see their interactions in other galaxies,” Hailey said. “In a sense, this is the only laboratory we have to study this phenomenon." 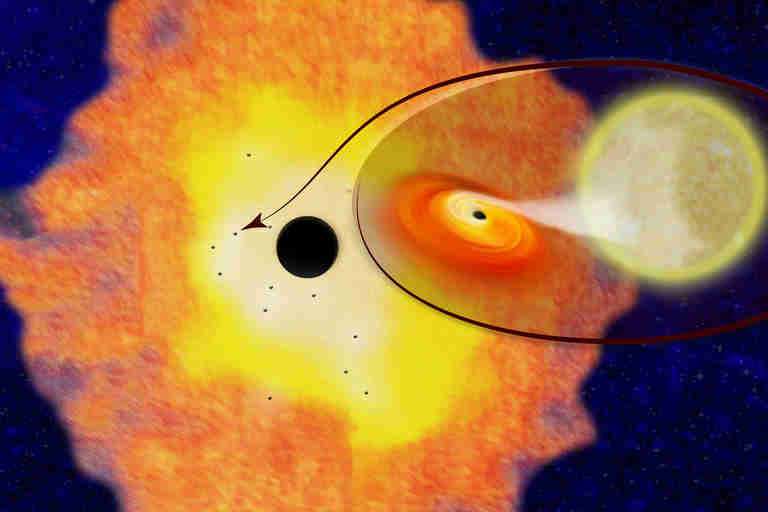 Stellar-mass black holes form when massive stars end their lives in supernova explosions. The Milky Way galaxy contains some 100 billion stars, and roughly one out of every thousand stars that form is massive enough to become a black hole. Therefore, our galaxy must harbor some 100 million stellar-mass black holes. Most of these are invisible to us, and before this new finding, only about a dozen others had been identified, and the nearest one is some 1,600 light-years from Earth. While it has been exciting to finally confirm a long-held theory, Hailey said their findings are also very relevant for the exciting work going on in gravitational wave astronomy.